프로브 삽입 시 test tool과 연결되며, 전압소스 활성화 시 LED lamp 표시됨. 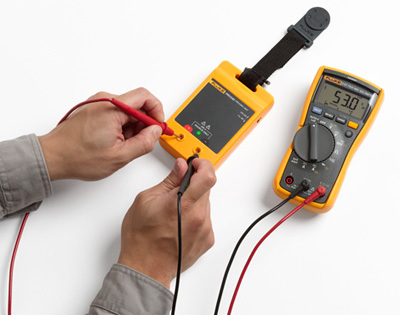 The Fluke PRV240 Proving Unit is a portable, pocket-sized, battery-powered voltage source. It is unique in that it sources stable ac and dc voltages for both LoZ and HiZ instruments. 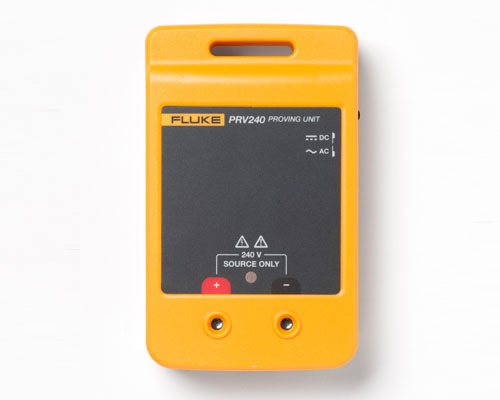 The Fluke PRV240 proving unit provides a safe and easy method for verifying proper operation of your test tool before attempting to test for either an energized source or a de-energized source without the need for cumbersome PPE, or in cases where no known voltage source is available. Your environment may still require minimal PPE such as hard, safety glasses or earplugs when using a proving unit. The PRV240 reduces the risk of shock and arc flash by removing unnecessary exposure to a potentially hazardous electrical environment while verifying the functionality of test tools before and after absence or presence of voltage is checked.